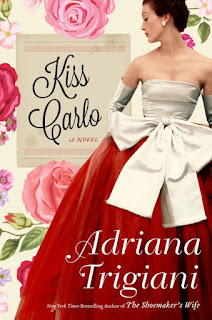 Instead of My Big Fat Greek Wedding, Adriana Trigiani's Kiss Carlo is a My Big Crazy Italian Family story. And I should know because I've got the remnants of one of those. In fact, some parts of this felt very similar to the (unofficial?--I was little so I don't know if they spontaneously happened or were planned) family reunions that seemed to occur every year at one of my distant relative's house. I recognized the love and loyalty in the book but also the long holding of grudges. It was a fun, somewhat nostalgic read but it also reminded me of the not perfect parts of my own crazy southwestern Philly family. The story opens in South Philadelphia with the falling out of the two Palazzini brothers over a promised inheritance that went to the wrong brother, effectively splitting this formerly close family in half. Then it jumps to 1949 and the small mountain town of Roseto Valfortore in Italy, where the town's ambassador, Carlo Guardinfante, is getting ready to leave for the US and the town of Roseto, Pennsylvania's Jubilee in hopes of convincing the town's Italian Americans, whose parents and grandparents emigrated from Roseto Valfortore to help the Italians rebuild their flood destroyed road, something they can't afford to do on their own. Once the story gets going though, it centers around Nicky Castone, a nephew of one of the original Palazzini brothers. Nicky drives a cab for his Uncle Dom and has been engaged to Peachy for seven years. Orphaned at a young age, Nicky was raised by his Aunt Jo and Uncle Dom, easily and happily enfolded into their large and growing family. But as Nicky starts to look at his life, he's no longer certain he wants to follow the path set out for him by others. What would really bring him happiness is to act. He's been moonlighting at the Borelli theater for several years and when he gets his acting break under the direction of Carla Borelli, who is taking over the theater from her father, he knows he has found his purpose. But divulging his change of plans to everyone in his life, especially Peachy, sets off a chain of events no one could have predicted and will pull together the disparate beginnings of the novel. The plot has some almost farce-like elements as it borrows from the mistaken identity plots in Shakespeare, the only plays that are put on at Borelli's. It is light-hearted and comedic in tone and there are many, many plot threads and secondary characters taking the stage in turn. The side stories give context but there are a few too many of them at times and there is an odd abruptness to the story as it comes closer to the end, especially given the long and detailed build ups earlier in the novel. Nicky is a character who is clearly still trying to find himself, even at thirty years old, but he has a good heart and readers will root for him. This is a family saga with heart, a warm and inviting read, and if there are too many plot threads that don't necessarily move the story along, it does give the novel a big cinematic sweep. For all of its 500 plus pages, this is a relatively fast read. Readers who like family sagas, enjoy allusions to Shakespeare's comedies or acting, and those who are drawn to the nuttiness of large, crazy families should tuck this into their beach bags for sure. 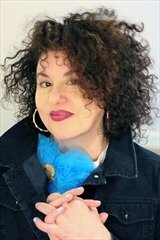 For more information about Adriana Trigiani and the book, check out herwebsite, like her on Facebook, follow her on Twitter, or check out her Instagram. Check out the book's Goodreads page, follow the rest of the blog tour, or look at the amazon reviews for others' thoughts and opinions on the book. The families in Trigiani's books always feel familiar to me - my own family is a lot like them.